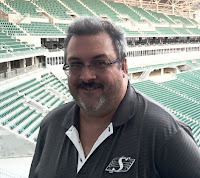 --If the intention of whomever gave Justin Dunk the information about reducing the Canadian player ratio in the CFL was to divide the union, then mission accomplished. Since that news came out there have been a thousand different takes on it. A lot of them are solid arguments on both sides. --The first CFL mock draft I have seen is out. Mock drafts are what they are and we all know you can't put a lot of stock into them, but the one on CFL.ca has the Riders taking DL Robbie Smith from Laurier. Is DL an area of need for the green-and-white when it comes to Canadian talent? You can never go wrong with an o-lineman and as always there are a lot out there, but I would like to see the team maybe upgrade its Canadian talent at RB. There are a couple of good Canadian RB's out there in Maleek Irons and Brady Oliviera, but I don't know if you take either at 6. It's always at this time of year when I am fascinated by what goes through organization's minds and the mock draft after mock draft after mock draft that they engage themselves in. I would love to be able to sit in a war room one night and watch things go down. --It's time to get real in the WHL as the playoffs begin tonight. The Moose Jaw-Saskatoon series should be fascinating. On one side of the blueline is a Moose Jaw team that has not had a lot of playoff success with some very good teams---teams better than this one against a Blades squad that is stacked and has not been to the playoffs for a while. I could give you a lot of reasons as to why Saskatoon wins and a lot of reasons as to why Moose Jaw does. This should be a great matchup. It's a coin toss to me, but I will take Saskatoon just for the fact I think they have the better goalie in Nolan Maier. Wouldn't it be great if we didn't have to go to WHL Live to watch some playoff games around here? The fact the WHL doesn't have a TV deal outside of the one Access has with the Pats is just wrong. It hurts the overall product. Scruffy, where do you get off insulting the fans on this ratio thing? Obviously they take pride in Canadian talent or there wouldn't be all the comments being posted. Why don't you listen for once and get off your high horse. Motley Crue... did axremix or a cover of Modonna's Like a Virgin?? I would expect it has something to do with the release of their biopic Netflix movie that premieres tonight! I have to agree with SWC, I am sure I am like most fans, to be blunt I don’t have time to follow Canada west, CJFL as religious as I would like. Work, family, life commitments on a whole get in the way to spread whatever free time I have that much thinner. Those leagues are in tough unfortunately when it comes to people like me and the market place with no tv exposure, little local media attention, The Riders, NFL other forums of entertainment ect. To say I thumb my nose at those leagues is an absolute disappointing comment from someone who is paid to do radio commentary for the Rams. I really hope they don’t loose the Canadian jobs in the CFL, my biggest concern once they are lost they are never coming back, the game will start to loose some of that Canadian feel to it plus it will kill the grass roots of Canadian football slowly. Too bad the liberal government doesn’t try and make back room deals to save these Canadian jobs?? Sidhu and drunk driving whats the difference? I seen on social media people hoping he gets a light sentence, feel bad for him, he is suffering enough..... All the same can be said for a drunk driver, I am sure they never meant to cause the pain they did, have incredible remorse for their actions, appoligize in court, however their actions were selfish, reckless, dangerous and there has to be consequences. The victims families deserve some vindication for what this man did. Regarding the ratio, one thing I haven't seen or heard discussed yet is an increase in the CFL roster. I know it would have to involve a corresponding increase in the salary cap, but I'm sure that must be in the works anyway with the new CBA. What I would propose is an increase by a number, say two for example, and then make it mandatory for those spots to be taken by Canadians. That would allow for more Canadians to be developed into game ready starters. My feeling is that coaches don't care about the passport. If a Canadian proves he is better than an American, then he will play regardless. I've heard it say that Americans are game ready quicker because of their experience down south, and that could be true. However more Canadians on the roster could give them the game action they need to excel and become starters. My two cents. SWC: Scruffy isn't wrong. You don't care where a player is from, you just care as to whether or not he looks good in a precious green uniform. When you go to a hockey game, do you care how many Euros are on the roster or how many Americans are on theice? NOPE! Take a look in the mirror pal. Unless the kid is a local one like Clark, Evans or Labatte, none of us really care where the birth certificate is. Quick: Where did Brad Sinopoli go to school? Where did Andrew Harris go to school? If you can't answer the question right away, its because you don't care. The CFL will always need Canadians, but are there enough quality ones to go around if the league expands to 10 teams. That is the question that should be asked. The Warriors will choke again. They always do! The movie premiered at 3am Eastern this morning! anyone know where the Manziel interview mentioned can be viewed? Mitch Picton dominated university football for five years. are you comfortable with him taking a starting spot for 18 games with the Riders next season. if you are truly fine with it, you care about the ratio. if you aren't comfortable you don't! whats the update on the NFL game? gone pretty silent. I am only saying this because you brought up the subject; I deserve whatever sentence that Jaskirat Sidhu deserves. I committed the same crime for which he has claimed responsibility. Thankfully no one was injured when I did it. Yet my confession does not absolve him nor me. 16 lives lost, numerous injured, total 29. 8 year sentence insufficient. Do the math. If you break down the the sentence on death alone, that's 6 months for each individual lost. Sidhu negligence not only effected 29 individuals directly but also their immediate families left to deal with a lifetime aftermath. Consecutive sentencing would have been more appropriate to this judgement leading to a far harsher consequence to the convicted offender. Very likely this individual gets parole in a very short order of time into his incarceration (this being Canada) leading to his release and immediate deportation to his homelands. Time for Canada and society to tow the line and set across the board sentencing guidelines appropriate to such incident. To the "Take a look in the mirror pal." guy. I do care about the Canadian ratio and take great satisfaction in telling people that I played high school football against two future Roughriders many years ago. Oh, and I still attend all of our high school football games here in small town Saskatchewan. I scored 4 touchdowns in a single game.